Looks like this track has been leveled recently. I may be mitaken,But I believe I raced here in 1991 or 1992 with the Michigan Off-Road Championship Series. I drove the Red Baron Racing #621 1-2 1600 limited class car. Cant remember how I finished. The series was run by Mike Brunton. We raced at fairgrounds all around Michigan. I won the points in 1992. Lots of fun!. I seem to think my dad told me a guy got killed racing there. Something to the effect there was a wooden guardrail or fence and the guy hit it and a board impaled him. I thought he said that''s when they quit racing there or shortly there after. My dad is dead now but it seems like he was telling me about it when we went to tractor pulls there about 30 years ago. Anyone ever hear or know if that is true ?. 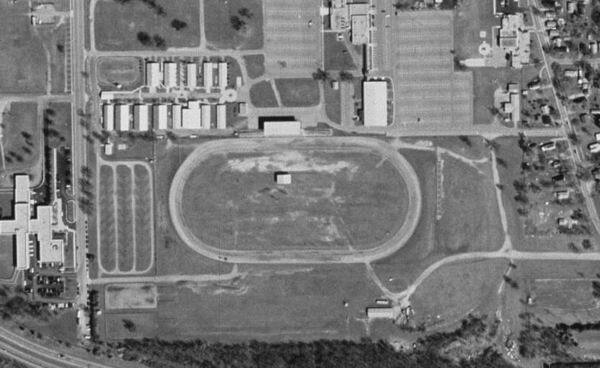 About 10 years ago the fair board decided to make the track into a horseracing track only. So the only racing that has been done there is what can fit in the infield. They helded a car motocross there last year and a night of destruction but that is all. My family has been involed in racing in this area for many years. The last real racing was done at the fair grounds when Bill Olney owned and operated the Galesburg Speedyway and when he sold it the new owner only raced at the fair one more time.